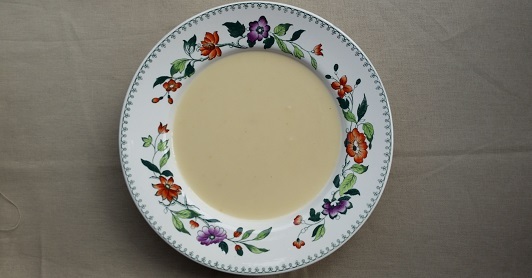 This recipe for cream of celeriac soup is probably the simplest soup I make (even simpler than the very easy frugal lentil soup I shared a few days ago) but it has a great flavour. 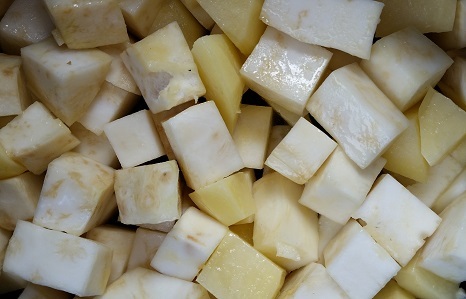 The main task is peeling and trimming the celeriac but it doesn’t take too long, especially if you use a vegetable peeler. 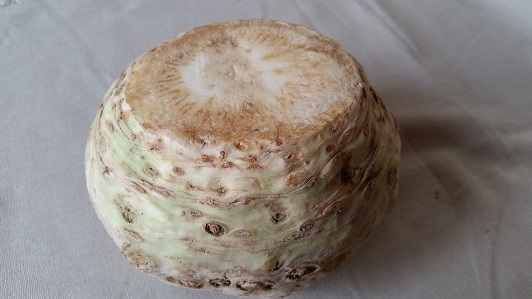 Celeriac starts off as a fairly unattractive, lumpy thing but get rid of all the peel and any lumps and bumps and discoloured bits and it’s easily transformed into a beautiful pale creamy soup. There are all sorts of flavours you could add to this soup. I expect nutmeg would go well or you could try stirring in some horseradish towards the end. I like it just as it is but you can experiment if you prefer. The other thing that I imagine working well is replacing the milk with one of the nutty milks (unsweetened), perhaps almond milk or hazelnut milk, and I will try that at some point. Because the milk is only added right at the end I think you could use any type of milk, even those that have a tendency to split if you boil them. Melt the butter in a large saucepan then add the chopped celeriac, potato and garlic. Stir well and cook gently for 5 minutes with the lid on (don't brown the vegetables). Add the vegetable stock, bring to the boil and simmer with the lid on for 30 minutes. Add the milk and blend until smooth.